Will Carnival’s first-quarter yield enough profits to satisfy investors? Carnival (NYSE:CCL) capped off 2018 with a solid fourth-quarter earnings report. Unfortunately, its outlook for 2019 wasn’t all that great, sending Carnival stock down even further and finishing the year with a negative total return of almost 23%. 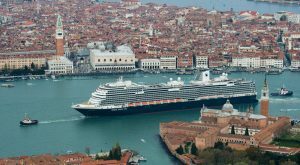 The world’s largest cruise line reports its Q1 2019 earnings March 26 before the markets open. Thanks to its disappointing outlook for the year, investor expectations are low heading into Tuesday’s results. Therefore, if Carnival can meet analyst expectations in the first quarter, it will set the tone for Carnival stock throughout the remainder of 2019. So, it’s safe to say, tomorrow’s report is a big one given CCL stock’s total return for the year is closing in on 16%; a good report would keep the momentum going recovering most, if not all of its losses in 2018. The company got a little good news leading up to earnings; Goldman Sachs (NYSE:GS) analyst Stephen Grambling upgraded Carnival stock to “Buy” from “Neutral” March 13 raising his 12-month target price two bucks to $65, an upside of 16% based on current prices. If you own Carnival stock, this should give you a little confidence heading into the company’s earnings report. On that front, the seven analysts with a Q1 2019 estimate, see EPS of $0.44 with the highest forecast at $0.47 with $0.41 for the low. Two analysts have revised their estimate upward over the past 30 days while none have revised downward. In December, the company’s guidance was for somewhere between $0.40-0.44 a share, down from a year ago when it earned $0.52 a share in the first quarter. If it were to miss the analyst estimate of $0.44 by a couple of pennies, I’d expect CCL stock wouldn’t drop much on the news. Anything below 40 cents would be a bloodbath. The company set for very low expectations for earnings, so it’s unlikely to miss. In terms of revenue, the average estimate for the first quarter is $4.31 billion. If Carnival hits that top-line number, revenues will have grown by 1.8% over Q1 2018. As part of its 2019 outlook, Carnival stated that its net revenue yields in the first quarter would be flat to last year at $160.32. Overall, Carnival expects 2019 net revenue yields to be 1% higher than last year, which were at record levels. Goldman Sachs’ analyst pointed out in his upgrade that Carnival is better positioned than its peers should a recession hit, something that’s getting likelier by the day. That makes Carnival stock attractive relative to its peers. “Carnival’s lower bar on guidance, cheaper valuation vs. history, lower financial leverage, and historically less economically sensitive business model vs. peers have created a more favorable risk-reward where the potential downside in a recession scenario is outweighed by potential upside in sustained macro momentum,” Grambling stated in his note to clients. So, if you own Carnival stock, I wouldn’t expect anything too negative that would affect the CCL stock price. However, anywhere above $0.44 could result in a nice bounce. Despite the scary pictures from the air rescue of stranded cruise passengers off the coast of Norway this past weekend, the cruise industry is very healthy at the moment. At the time of this writing, Will Ashworth did not hold a position in any of the aforementioned securities. Article printed from InvestorPlace Media, https://investorplace.com/2019/03/carnival-earnings-will-set-the-tone-for-the-rest-of-2019/.